This is the story of how a meeting with the Ooni of Ife turned out to be an encounter worth penning down. These words struck me the most during my 2-hour visit to the 51st Ooni of Ife, Oba Adeyeye Enitan Ogunwusi in his palace. On Friday, December 14, 2018, the crew of ‘Queen Moremi: The Musical‘ and myself went on a trip to Ile-Ife in Osun state. The trip was significant for three reasons. Firstly, the Yoruba monarch was one of the patrons of the stage play produced by Terra Kulture and Rejuvenee. Sacrificial love for her people 🖤. Moremi calls out to the River goddess Esinmirin for help and she answered. Secondly, the legend of Queen Moremi which is from pantheon of Yoruba gods and goddesses happens in ancient Ile-Ife. Thirdly, when it comes to the Yoruba nation, Ile-Ife is its spiritual home with the Ooni as the supreme monarch. The Ooni of Ife is the direct descendant of Oduduwa, the founder of the Yoruba race. 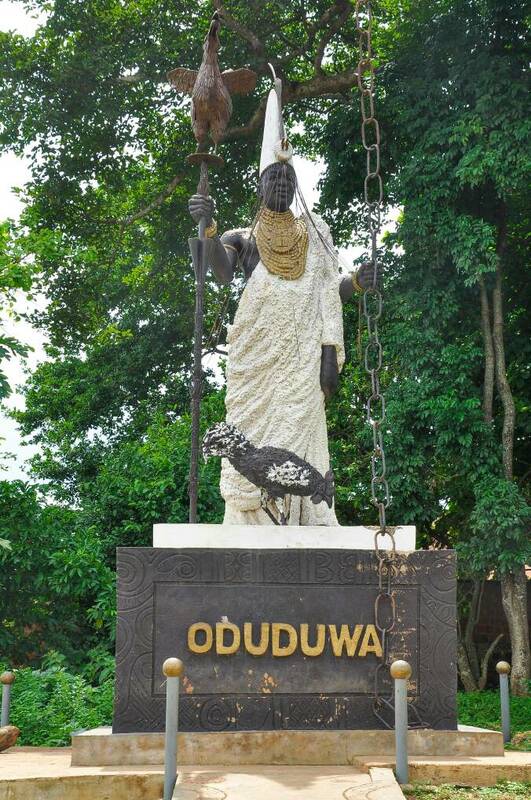 Depending on who you ask, Oduduwa is either an Orisa sent by Olodumare to create land on a water-filled earth or an exiled prince from Saudi Arabia. After a 5 hour trip from Lagos (thanks to a draining traffic jam), I finally got to the center of the universe. Ile-Ife is no Narnia or Asgard. Modern-day Ile-Ife is not levitating pyramids or an afro-futuristic hub of black excellence in the mould of Wakanda. Nope, Ile-Ife is a place that is delicately balanced between its rich heritage and a city of over 700,000 people. It’s part 3D museum of heritage sites and a hub of commercial activities. When I got to Ife, I couldn’t help but think that this was the land where my ancestors walked, where they fought, where they made history and became legends. It’s one thing to read the stories, it is another thing to be aware that you are in the same place where Oduduwa descended from the skies with a chain. The trip from Lagos was tiring. The crew and I stayed at the Ife Grand Resorts and Leisure owned by the Ooni of Ife, where we ate and rested for a few hours. The rest was highly welcome and not just because of the hours we had spent on the road but because of Lagos itself. 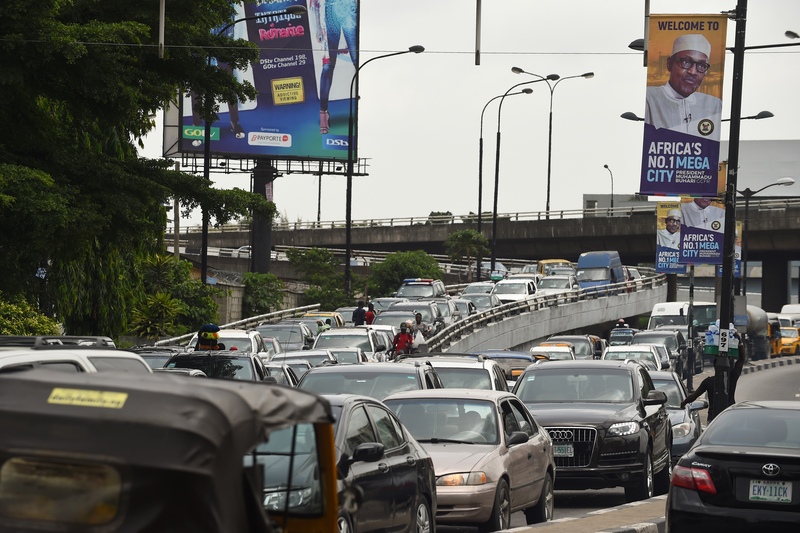 In December, Lagos had become a monster that was squeezing the life of people in the city by locking them up in hellish traffic. The city had become stifling, a claustrophobic concrete jungle where the air was hot and living spaces choked. Here, I was a Lagos boy in Ile-Ife, a peaceful and quiet place, soothing and comforting without any trace of the Lagos stress. I had to admit that when I was told that I had to travel to Ile-Ife at the office, I wasn’t too excited. I rarely get wanderlust. I am not spontaneous. To get me to travel outside of Lagos, you will have to tell me about it weeks ahead to get mentally prepared and not a four-day notice. I was happy that I made the trip at then end of the day, for I had the opportunity to detox myself from Lagos for at least 24 hours. When it was 7:30pm, the cast of Moremi: The Musical, Abas (the cameraman who followed me from the office) and I, went to the palace of the Ooni of Ife. I felt awkward during the short drive. For one, I wondered how it would feel interviewing the father of the Yoruba nation, a man whose ascendancy and reign has attracted a lot of press attention. Another reason was that I felt out of place not wearing a traditional attire. While the cast dressed in traditional clothes befitting of meeting the Ooni, I wore my standard outfit of a long sleeve shirt, a pair of Jeans and blue Chelsea boots. Anyway, we got to the palace in short time. When entering the palace grounds, I heard a loud noise not too far off. I thought a concert was happening. I will get back to that later. The palace of the Ooni of Ife is what I thought it would be, sprawling, commanding and a display of the conservative opulence expected from one of Nigeria’s biggest traditional rulers. 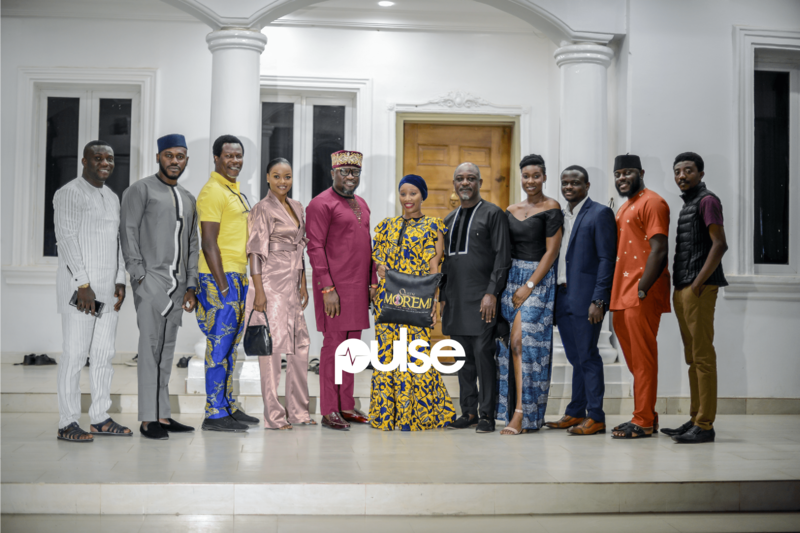 The cast could not help but take pictures in front of the Ooni’s main mansion. While they took turns taking pictures, I looked at the immaculate white Rolls Royce, and Mercedes Benz S-class parked not too far off. It’s good to be a king. I also studied His Majesty’s royal insignia that was designed into the palace ground. I even took a picture beside one of the insignias on the palace gates. It was a poorly lit photo but, it meant more to me than a picture in front of Buckingham Palace. And why shouldn’t it? Why should we celebrate colonizers and ignore our heritage which has been sold to us as backwards and fetish? After taking pictures, we moved further into the palace grounds and stayed in a hall which I presume is the Ooni of Ife’s press conference room. In the conference room, loud music in praise of the Ooni of Ife blared from the audio system. Singer after singer heaped praises on the 51st Ooni of Ife. While we listened to praises that could make an average man go dizzy, we were served Jollof rice and chicken. Our second meal courtesy of the Ooni within the space of three hours. And this is the point where we waited…for the king. We heard him before we saw him. The voice of the Akewi of Ooni rang loud. This was followed by a flurry of activities in the press conference room. Then he came in his all-white regalia, the Ooni of Ife. Oba Adeyeye Enitan Ogunwusi ascended the throne of his fathers on December 7, 2015. He is the successor of Alayeluwa Oba Okunade Sijuwade who ruled for 35 years. The 51st Ooni of Ife has been a fascinating monarch, with the public transfixed with the young king (he is just 44 years old). His use of social media has intrigued a lot of people who are used to kings operating within the confines of their traditional office. The Ooni of Ife has shown that he is not afraid to switch things up. My own Nigerian Youths, I’m indeed part of You, please wake up from your slumber and let’s join hands together to take Nigeria to another level. Nobody will do this for us. 7 out of 10 Nigerians are youths. Oba Adeyeye Enitan Ogunwusi has been very vocal about the potential of tourism in Nigeria especially in relation to our culture and history. 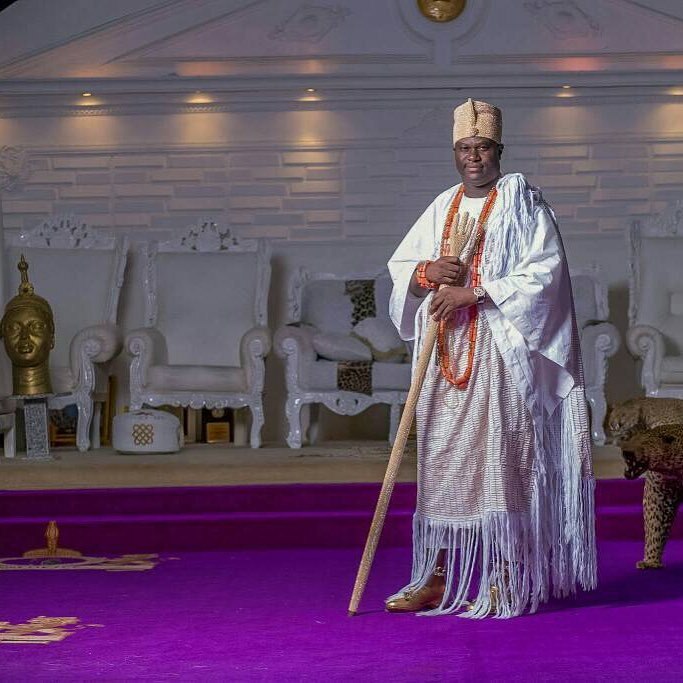 “Ife is now the new destination in Africa as the sleeping giant of tourism in Africa wakes up to a new reality,” said the Ooni in 2016 as reported by Vanguard. The Ooni of Ife was more than pleased to meet the cast of Queen Moremi: The Musical. You could see that he was enthusiastic that a Yoruba legend was being produced on stage. “To the Glory of God, as a progenitor of the black race that I sit on the throne of Oduduwa, it has never happened in the history of the world that we the aborigines in Africa, will tell our stories by ourselves. For the Ooni of Ife, it is important that Africans, Nigerians and Yoruba people tell our own stories without any interruption from the West. He believes we should own our narrative and turn around the perception that our tradition and heritage are backward and fetish. He also believes that the promotion of our culture will help connect a new generation to the glories of our past and the beauty in appreciating our heritage. “When I came back to this throne I made up my mind, that things like this we need to let the world know who we are and what happened several centuries ago for the generation yet unborn. And the current one should be very proud and have a sense of place in our heritage and in our tradition” he said. African traditions, pre-Black Panther, pre-Beyonce channeling Osun and Yemoja, have been tagged as uncool by African millennials, and evil by Pentecostal Africans raised by parents who went to Anglican and Catholic churches that called our forefathers pagans. With Afrofuturism coming to the fore as of late, there has been an interest in African culture. A younger generation of people is starting to realize and appreciate legends, stories, mythology from Africa. “To the whole world, our tradition has been bastardized. To the whole world, our heritage is nothing to write home about. The western heritage is what people have endeared their hearts too. The truth be told, ours is way superior, ours is way older, ours is more potent. And we have to tell our story and it is important” the Ooni observed. For the Ooni, it is not all about blaming the West. When I asked him for his thoughts about stolen artifacts in British museums and if they will ever be brought back, he said this “Well, to me it does not make any economic sense for us to just keep shouting that we should return our artifacts. We should act. How? Let us create an enabling environment. “How are we going to store our own artifacts? How well are we going to inculcate the museum and monument culture? In the western world, an average young lad goes to museums. They want to know their history but they don’t have a lot of content. It is our content they usually display so I am not opposing bringing back our artifacts but what are we going to do with them? Where are we going to keep them? “They build skyscrapers, wonderful buildings for our artifact. Are we ready to do this? Most of these artifacts, figurines, effigies, are spiritually inclined. The western people don’t know how to unlock the spirit behind each of this artifacts. “We can work out an arrangement to loan them the same way they loan gold. 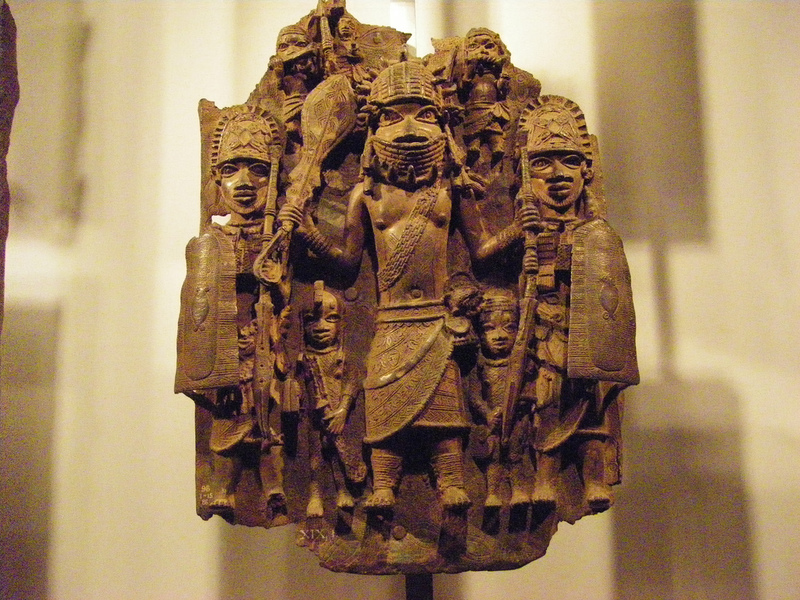 We have a lot in our museum in Ife here, we can loan the artifacts and bring them back later willingly. I speak to that school of thought” he explained. Oba Adeyeye Enitan Ogunwusi is a man of two parts. The Ooni of Ife has a great sense of humour and is very in touch with Nigerian pop culture. During our 3-hour plus conversation with him, he would often pepper his words with slangs, phrases and anecdotes. He banters freely with a lot of his servants and is the consummate host, ensuring that we had been fed and had enough to drink. He is relatable, jovial and a stand-up guy. Then there is the other side of the Ooni of Ife, a repository of Yoruba knowledge. And when he is in this zone, he is a different person. In the lecture (it was more of a lecture than a discussion), the Ooni of Ife spoke about the supremacy of Ile-Ife, Jesus Christ, the connection between Queen Moremi and the statue of Liberty in New York, the special crown he only wears once a year, and so many other things. The experience of listening to him talk is to have a lot of things you have been told as the truth crumble before your eyes to be replaced by the illumination of new revelations. It could be tingling and confusing at the same time as a new world opens up to you that challenges what you have believed in for years. By the time the Ooni of Ife was done speaking to us, a few minutes past midnight, we were left in a whirl, dizzy from the amazing things we heard. After entertaining and informing us, the Ooni of Ife left just as how he came but that was not going to be the last time I would see him that night. When Abas and I went back to the glass house in the palace to retrieve his tripod, we saw the Kabiyesi leaving the palace with his entourage. He was on his way to the grounds outside the palace where the noise was coming from. Apparently, it was a Christian programme ‘Hosanna Night‘ his queen, Olori Silekunola Moronke Ogunwusi, organizes every year. This is one of the fascinating things about the Ooni. The head of Yoruba spirituality attending a Christian crusade? Well, it might appear as a walking contradiction to you but after spending a few hours with him, I became aware that the universe is connected in more ways than we think. On our way back, the cast talked about what the Ooni of Ife said during the meeting. It was a profound encounter. The next day we visited the Queen Moremi statue, a 42 feet statue which makes it the tallest in Nigeria. It was commissioned by the Ooni of Ife in 2016. At the statue, we met an old woman who is happens to be the custodian who narrated the full version of Queen Moremi and her courageous decision to liberate Ile-Ife. A bottle of Schnapps was opened and poured on our feet. The old woman prayed for us, especially Kehinde Bankole and Tosin Adeyemi who would play Moremi in the stage play. After taking a bunch of pictures, we left for Lagos. A week later, I was at Terra Kulture for the opening night of Queen Moremi: The Musical. It was a spectacle. You can read the review here. Unfortunately, plays like this should not be an exception but the norm. There is no reason why the story of Moremi shouldn’t be taught in primary and secondary schools in the South-West. The same applies to every region in Nigeria. Every child should know the legends of where he or she comes from. This is how we can truly be one with our heritage. We shouldn’t view our past as exotic but a representation of who we are. After listening to the Ooni speak, I think there is no one better to fit this role.